Celebrate the small surprises and the big accomplishments. Life is too short to leave a special bottle of wine unopened. This Champagne Wishes! dinner party is perfect for your next celebration, whether it be a major life event like an engagement or just a good day at work. The menu is straight forward yet elegant. The luxury of filet mignon is balanced out by a simple mushroom topping and side of steamed spinach. 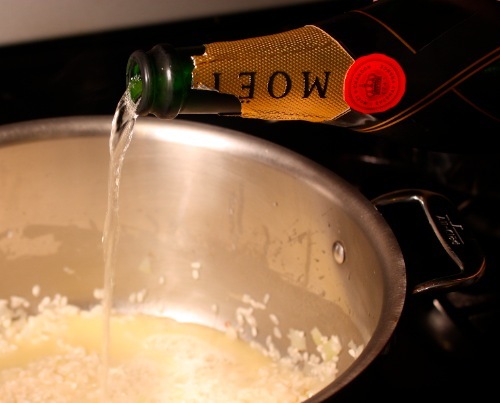 A touch of champagne in the risotto brings the celebration full circle. What are you celebrating? In our case, we are celebrating moving on to the next round in Project Food Blog! Our luxury dinner party was truly a celebration. As we enjoyed the champagne risotto and filet mignon, fireworks began outside our window. I am not joking. This challenge was made for me. I eat, sleep, and breathe playing hostess, but I like to keep it simple and easy. You never want to tire of hosting. 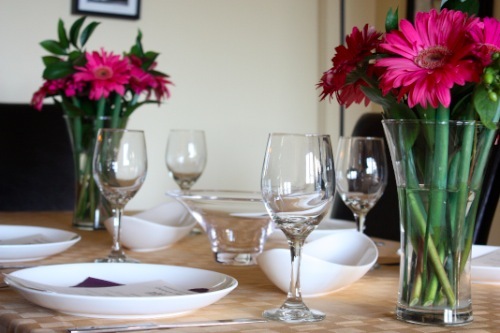 Hosting a successful dinner party can be as easy as fixing yourself a cup of tea. It just takes a bit of patience and practice to get there. You don’t have to spend the entire week leading up to a party slaving in the kitchen, market, or dining room. For the 3rd challenge of Project Food blog, the Luxury Dinner Party, I could show you a super fancy table. I could show you fancy, time-consuming dishes. Hosting dinner parties should be fun. If you are intimidated or think you are not up to the challenge – I’m here to prove you wrong! You don’t necessarily even have to be an excellent cook. With a few key components, it will come together and be fantastic. A dinner party is just a “dinner” unless you make it a PARTY. Let me teach you how. My favorite part of playing hostess is creating the theme and menu. 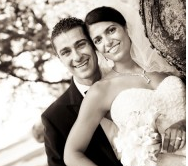 For your theme, consider your occasion, season, guest list, and amount of time and space. Your menu should reflect your cooking abilities and your time. If you are a new cook, don’t overreach. Keep it simple and straightforward. Choose an appetizer, main dish, a few sides, and a dessert. Test your recipe once before the party to avoid any surprises. Keep the pairings natural but don’t be afraid to experiment. Make a comprehensive market list. Then make a comprehensive to do list. Select theme & menu. Invite guests. Make a dinner party music playlist if you don’t have one. Consider your table settings. Purchase any necessary items. Prepare small touches for guests, including fresh hand towels in the bathroom. Select serving trays. Presentation is important! Cook any items you can make ahead. Buy bread, flowers, and other last minute items. Cook all dishes that can be made a few hours ahead of time. Get yourself ready – you want to feel beautiful too! Clean your kitchen so it is spotless, especially if you have an open kitchen design. Play music & pour yourself a drink to get into the party mood. Heat up dishes that need warming. Enjoy yourself! All the work has already been done, now it’s time to have fun. Always have mixed nuts, cheese, and crackers on hand. Select a one pot meal like lasagna or pasta. Make your table look beautiful, serve lots of wine, and relax. No one is judging you. A beautiful table, nicely presented food, and pretty serving trays will make the dining experience much more enjoyable. I select my serving trays a few days ahead of time and think about how I can make the food visually appealing. Sometimes it is about the tray you select, and other times it is about the small touches and garnishes you add. 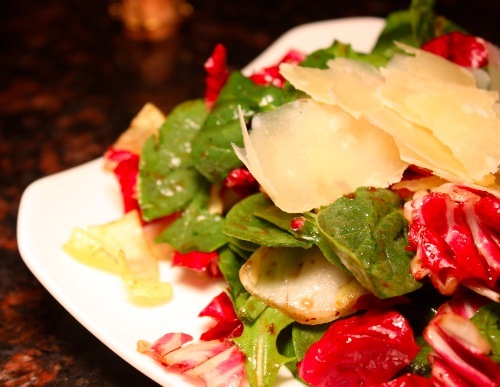 For the tricolore salad in this dinner party I chose to add the shaved parmigiano reggiano on top of the salad instead of mixing it in. For your table centerpiece, use natural elements. For this season, a bowl of beautiful small pumpkins would be nice. During the holiday season I like to fill a bowl with pretty ornaments. 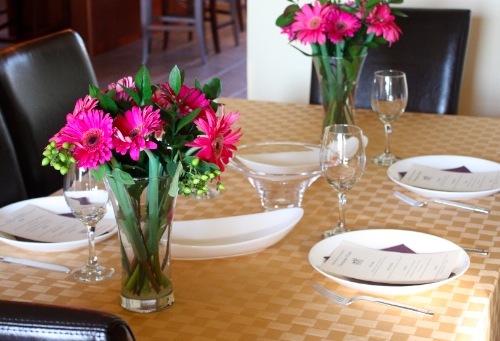 Simple vases with flowers turn an ordinary table into a beautiful one. 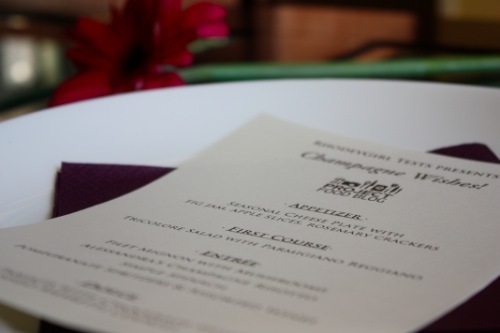 To make a dinner extra special, print up menus. Gorgeous cardstock from your local crafts store is surprisingly affordable and can be printed them on your printer at home! 1. Make sure you house is clean and comfortable for guests. 2. When guests arrive make sure they are your first priority. Most of the cooking should already be completed with only a few small tasks left. No one wants to party alone while the hosts are busy in the kitchen. 3. Let your guests join in the fun! I try to insist that my guests just relax, but some really want to help. My friends love to help slice the cheese, bring food to the table, or open the wine bottles. 4. Before your guests even arrive, turn on the music and pour yourself a drink in a pretty glass. Put on your party shoes and get in the mood! 5. Put a little piece of paper in front of each serving tray listing what will go on it so you don’t forget! Remove before guests arrive. If all else fails, drink more wine. 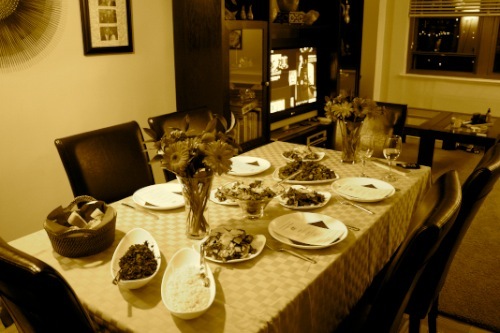 **This is my official entry for Challenge #3: Luxury Dinner Party in Project Food Blog. If you enjoy this post and think I deserve to move on, please vote for me beginning Monday October 4! You can click on the widget on the top right of my site to get to the voting page or click here! Thank you! Sabrina is the hostess with the mostess! Where are the beautiful plates and serving bowls from. Love the shape of the bowls! Good luck! @Tiffany, Hi Tiffany! The plates and serving bowls shown here are all from Crate & Barrel. It was a beautiful collection that I noticed a lot of restaurants use too, but it is about to become discontinued unfortunately. It is the Cuisine collection! I have been looking forward to your post for a while now. 🙂 I love the idea behind Champagne Wishes and you did a wonderful job! Our dinner party last night was the first time we have ever used our wedding china!! It reminded us how silly it is not to make use of things we enjoy more often. Life is too short. Gorgeous as always!! I love the theme, and your advice helped me plan for MY entry! i always love your timelines and love the dinner party theme! i’ve wanted to eat everything you make for almost a year now (wow, that sounds super creepy!) but this takes the cake! absolutely delicious, and i love the day-by-day instructions 🙂 of course you have my vote! You host a great party, Sabrina! This looks beautiful. Your presentation at HLS was great, so it’s no surprise that this lived up to your standards…and I love the champagne theme!! It’s 8:43 am on a Monday morning and I’m craving champagne … this might not be a good thing 🙂 Great post and beautiful photos. You’re the best. This looks sensational. 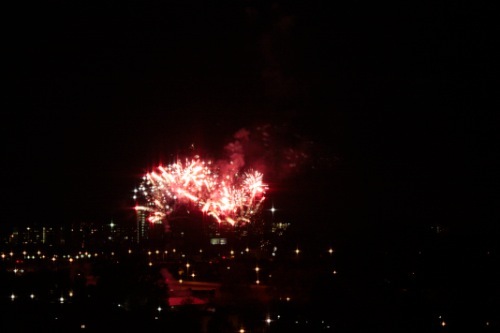 Wow…fireworks! Perfect surprise for your Luxury Dinner Party! To answer your question from my blog…It’s looking to be 99% sure I’m going!! I’m preregistered so hopefully they open real registration soon so I can book my flight!! Will you be there?? Wow, I’m impressed. This is exactly the type of party I hoped to see when I knew this was the upcoming challenge. You always have elegant, top notch parties and I love that. Great advice Sabrina. The presentation was stunning! Well done!!! I’m off to vote for you! BEAUTIFUL entry! Voting right back atchya! So gorgeous, and inspirational as always! Your mother’s champagne risotto sounds amazing. Fabulousness! I love the pretty flowers. Can I be you for a day? Or better yet, hang out with you for a day? I would love to plan a dinner party with you, because I have never done it myself. And honestly, the idea of it TERRIFIES me. This is an incredbile dinner party. I am voting for you. Right. Now. @Astrid, Thank you so much for your comment and vote Astrid! When you are ready to host a party.. please email me and I will guide you through it! looks like we could do some damage to a glass of sparkly. 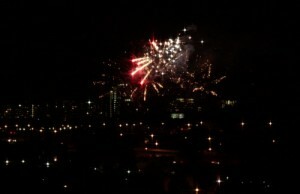 how cool that there were fireworks after your meal. must have been fate. good luck! Is it bad that your last tip is my favorite?! Ha! Just gorgeous, Sabrina. You are the ultimate hostess! Nicely done and great tips. Voted! Wow, what was the story with the fireworks? Looks like a magical night! @Natty, We think there was a wedding maybe? We are still not exactly sure!!!! Great post! Food looks amazing. And you are right, if all else fails, more wine makes everything better. =) I voted for you. Your dinner party looks like it was fabulous! Hope we both make it to the next round! 🙂 You have my vote! Love the champagne theme! And your table setting is just gorgeous! Voted! Your menu looks absolutely delicious! Good luck in round 3! Voteworthy 🙂 You’ve got several of my golden dinner party rules in there – always have cheese and crackers on hand and, if all else fails, drink more wine! Being a person who does not normally post or comment to the world on things, I felt I need to comment on this meal. Being the recipient of this meal, some might say I am biases, that could not be further from the truth. I am by those who know me a pickie eater. This meal, was a complete surprise to me. I went not knowing really what the meal was. I just knew good friends and good cook means a great time. From the moment I walked in, it was wonderful. As we sat and talk through apps, I found my self surprised I was eating almost everything there. Heck, I at FIG JAM, I have NEVER done that. Almost too much eating, it was that good. When we sat down to eat dinner, I found myself wondering what my move was. Was I too full from the apps, will I like what RhodeyGirl had prepared (you get the idea). But pacing myself with eating the salad first, I slowly got into the rest of the meal. And I was surprised. Surprised that I enjoyed everything, well almost, I still can’t eat mushrooms :). So, I won’t bore you with all the details and thoughts that I had about each item I ate. But know this, the meal was GREAT. And if you don’t believe me, just ask my mom, RhodeyGirl told her what I ate and my mom was floored that after all these years, someone got me to eat great, delicious food! Thanks for the meal RG. I’ve been looking forward to your entry for this challenge and I think it’s so great how you really created a step by step agenda. So creative and clever! You make me dream of the day when I have my own little home to entertain and host guests in. I love your theme, and thanks for the play by play tips! 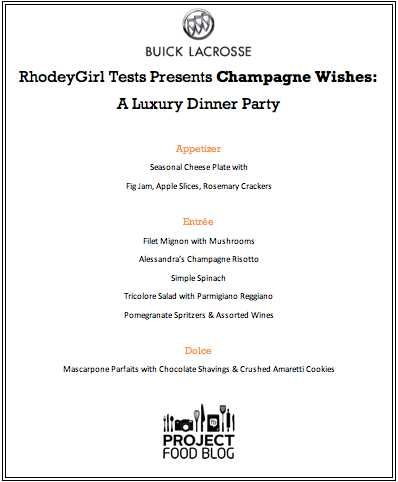 The champagne risotto sounds so unique and delicious…. great job!! Fantastic goods from you, man. I’ve understand your stuff previous to and you’re just too fantastic. I really like what you’ve acquired here, really like what you’re stating and the way in which you say it. You make it enjoyable and you still take care of to keep it sensible. I can’t wait to read far more from you. This is actually a great site.